The reasons to migrate to Australia are many and it is regarded as a land of abundant opportunities. It is multi-cultural, has a rapid economic growth, booming businesses, and offers great career opportunities to talented and professional people. The healthcare system, covered by insurance, is meant for all citizens and is superior. The high quality of education system ensures a bright future. There are exceptional schools and universities to choose from. The method to get Visa for Australia starts with the submission of an application to the immigration office. 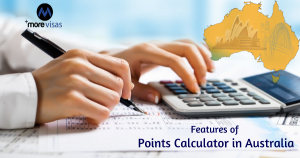 It is duly reviewed and points are awarded depending upon the criteria and conditions which are enumerated as The Australian Points Calculator. The application is considered on point’s basis which is conducted on an organized system for immigration managed by the Department of Immigration and Border Protection Australia. The minimum requirement is 60 points for skilled visa category and 65 points for Business Innovation/Business Investor category. These are calculated on the features like age, work experience, ability in the language, education received, qualifications, submission of application along with spouse, skill qualification of the partner, and regional study. This Minimum point requirement to get through different visa programs is as under. Here is the list of points for each parameter. You receive points ranging between 5- 20 depending on the number of years of work in Australia. The maximum points awarded in this category are 20 when the candidate has a Doctorate issued by an educational institution in Australia or other equivalent institution. in this category 5 points are granted when the candidate has a Diploma/trade Qualifications issued by an educational institution in Australia or other institutions which meet the study requirements. Community language qualification, studying in a region of Australia, or in a metropolitan area, skill qualification of partners, and completing a year, in a profession, help to get 5 points. Nomination/sponsorship given by a State/ Territory Government under subclass 190 can help to get 5 points. Nomination/sponsorship given by a State/ Territory Government or sponsorship by an eligible family member, based in Australia under subclass 489 is given 10 points.